The handsfree stabiliser is a unique camera control system. It allows you to operate a camera (or the iPad with Movie Mount) completely handsfree. It will rest on your shoulder and belly, and comes with a strap to secure itself. It will stabilise your shots perfectly. It will give you rock solid shots while at the same time allow you to move around freely. The handsfree stabiliser is a unique camera control system. 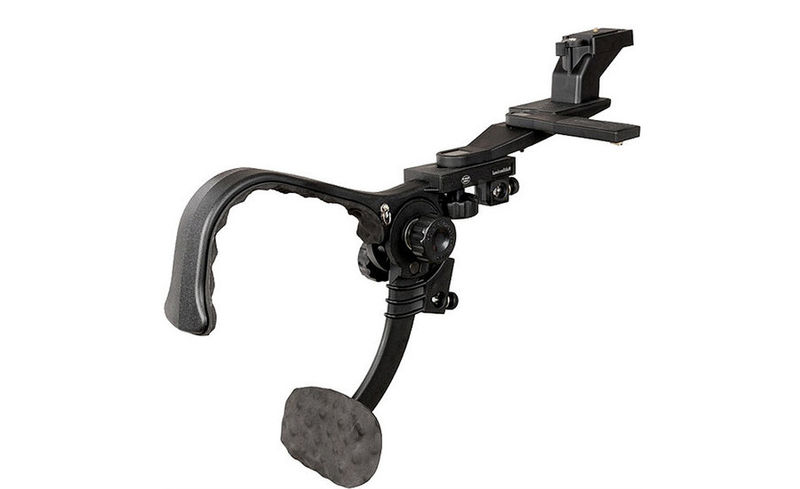 It allows you to operate a camera (or the iPad with Movie Mount) completely handsfree. It will rest on your shoulder and belly, and comes with a strap to secure itself. The strap, along with spring chest harness and padded shoulder mount offers a rigid support and keep hands free. It will stabilise your shots perfectly. It will give you rock solid shots while at the same time allow you to move around freely. The stabiliser arms are adjustable in all angles. This shoulder support pad stabilizer can lay down your hands and cut down the burden of arm with a unique dual braced sprint tension design. It is a great tool for steady professional recordings to avoid hand shaking or vibration. It's a must have item for travel or outdoor photography while using iPad/iPhone or DSLR camera. Max Loading Capacity:13 lbs/6kg. Note:Shoulder support pad only, iPad not included.